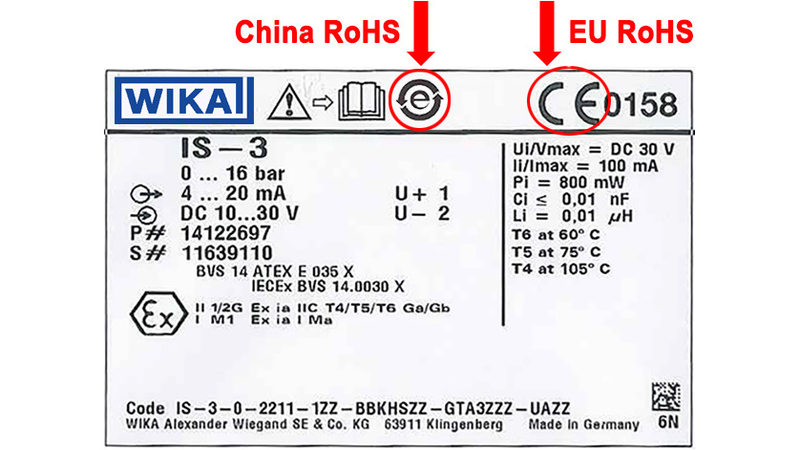 I am often asked, “How is a RoHS marking actually carried out?” The quick answer: EU RoHS will, from 22nd July 2017, be visible in the CE marking and the declaration of conformity linked to it. China RoHS conformant instruments carry a green logo. Non-conformant instruments in accordance with China RoHS carry an orange logo and require a manufacturer’s declaration. EU RoHS is part of the EU declaration of conformity for all products with CE marks. For the majority of WIKA products with electrical functions, the requirement in accordance with the 2011/65/EU DIRECTIVE of 8th June 2011 Article 4(3) applies “… to industrial monitoring and control instruments which are placed on the market from 22nd July 2017.” For all products with CE marks, the corresponding EU declaration of conformity is available on the product detail pages (“Approvals” tab) at www.wika.com. Today, instruments which fall under China RoHS must already be marked with the corresponding China RoHS logo on the product label. With compact products, the regulation SJ/T11364-2014 “Marking for the Restricted Use of Hazardous Substances in Electronic and Electrical Products” allows corresponding marking on the packaging label. For products with the “orange-coloured logo” or RoHS marking “10”, the corresponding manufacturer’s declarations “Declaration of manufacturer according to China RoHS” are available on the product detail pages (“Documents” tab) at www.wika.com. The green logo (alternatively black) shows an “e in a circle” and means that no hazardous substances have been used in the product. A manufacturer’s declaration is not required. The orange-coloured logo (alternatively black) shows a “10 in a circle” and indicates the use of restricted substances and presence of a corresponding manufacturer’s declaration “Declaration of manufacturer according to China RoHS”. Do you have any questions? Your contact person will be happy to help you. What does RoHS really mean? For which substances do the RoHS restrictions apply? For more than 20 years I have been working in the product management and business development in different divisions of the WIKA Group. Currently I am responsible for trends, new measurands and other general topics in the strategic portfolio management department of the industrial instrumentation division. In this blog, I would like to share my experience with you and provide an opportunity for further discussion.